This vehicle is available for viewing in Melbourne. 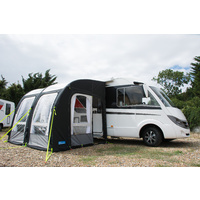 The Roller Team 259 is a very popular 4 berth model perfect for couples wishing to do extended tours. The Roller Team 259 has a spacious rear corner bed, modern corner bathroom with separate shower compartment. This European motorhome features a fixed double bed that drops from the ceiling as well as a dinette at the front that can be converted to a 3rd double bed for guests or children.